I’ve looked forward to Pirates of the Caribbean MMORPG, though with trepid enthusiasm. 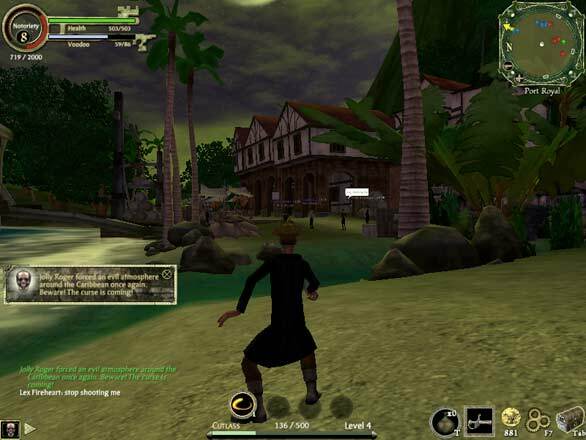 Games with movie tie-ins (this game is part of the Pirates of the Caribbean movie franchise) have a reputation of being bad, and as far as MMORPGs go, you have to provide stunning graphics, a compelling story, and streamlined and innovative combat to compete with World of Warcraft ( ) and other games. Unfortunately, I’m unable to lay many accolades upon the abysmal Pirates of the Caribbean—but it’s rare you get a game that is as deep as it is poorly realized. Pirates of the Caribbean is a MMORPG that puts you in the bootstraps of a male or female pirate tasked with helping the iconic Captain Jack Sparrow take on the evil undead pirate Jolly Roger. To drive home the fact that the game is tied to the movies, the opening minutes of the game introduce you to pixilated versions of Will Turner and Elizabeth Swan, characters from the Pirates films. OK, you hooked? Great, now you won’t see any recognizable characters (save, perhaps, Tia Dalma) for the next ten or so hours. The loose overarching plot deals with assembling the crew for Jack Sparrow and his ship, the Black Pearl. Each crewmember has hours of chore-like missions for you to do before you can get him/her to join and progress in the story. Side characters and side quests also exist to upgrade your weapons, get you money, or to explore new areas. Essentially, though, the quests have you sink some navy ships or kill some giant scorpions. These tasks lose their appeal after the first couple of hours. If you were looking for fighting techniques that involve subtle parries, quick stabs and the allure of swashbucking fencing, you won’t find it here. Instead, the combat is a combination of button-mashing and timed attacks, and gets old quick. You can slash with your sword, lob a grenade, shoot your pistol, or summon voodoo spells with your voodoo doll. The latter sounds cool at first but the spells are awkward to execute and provide a clumsy way for the designers to include magic into the game. In the initial stages of the game, I became aware once again that this was a Disney product. While you weren’t tasked with saving the Magic Kingdom, the game decides to pull some punches on the violence in order to make combat more kid-friendly. “The pirate code” discussed in the movies has expanded to regulate combat in the game, and so you’re not allowed to shoot humans and you can’t battle your fellow pirates at all unless one of you chooses to become an undead pirate. These rather curious developmental choices funnel people to very limited PVP interactions, which I’ll go into greater detail with later. Pirates offers you a great deal of character customization. Your character’s appearance can be altered down to the bridge of their nose, but in general every character model looks a bit awkward and less refined than the movie characters’ renderings. In scenes where your character interacts with one of the movie characters, the graphical representations are so different that it’s like they exist in different worlds. The graphics seem very dated, with a generous heaping of clipping, pathfinding problems, bugs, and unimpressive model renderings. I ran the game on a standard MacBook Pro 2.4 GHz using Macworld’s office Internet connection, and not only were the graphics horrific, but the game would slow down to the point of stasis when I ventured into some of the more important rooms. Yarr, the servers seem to be a crowded port. The sailing is perhaps the best realized of the game’s many aspects. You can pirate and crew your own ship, gradually upgrading it through experience and money, or you can take part in someone else’s crew and man the cannons. Crews that go into combat together get combat bonuses and so there’s an incentive to play cooperatively with other players online. One of the best thrills of the game is captaining a ship and ordering your fellow players to give a full broadside, watching with glee as the enemy ships goes down in a hail of cannon fire. You can also get a group together to board an enemy capital ship and take on its crew. Later, you’ll learn teleportation techniques to cut down on the time-consuming sailing between islands. 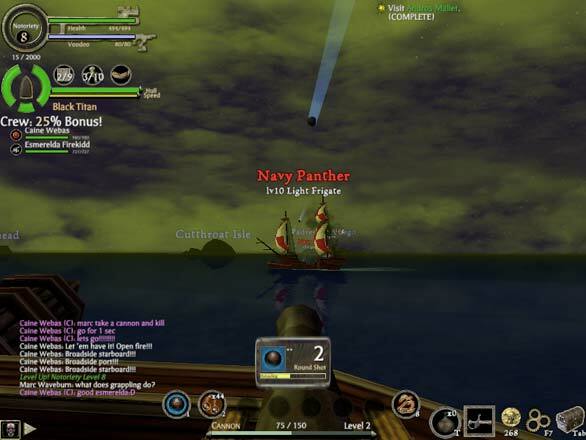 While sailing, you’ll regularly encounter British Navy, ghost pirate, and East Indian Trading company ships, along with your fellow online players. Player-versus-player experiences are limited; with sea engagements, you can have crew battles or do the Spanish/French side quests, while land engagements involve joining sparsely populated battle servers that require you to take on an undead form (wouldn’t want the kids to be scared by human-on-human violence!). There are only a handful of islands to explore and these seem to be poor renditions of the movie’s landmarks. Tortuga in particular fails to capture the anarchistic charm of the pirate island in the movies, instead resembling an uninhabited ghost town. Still, you can enjoy the poker mini-game at the Faithful Bride bar, and its inclusion is one of the cleverest parts of the game. What’s more pirate-like than gambling your loot away? The game is free to play in Basic Access mode, which is advertisement-heavy and has a level and content cap. For Unlimited Access, you’ll have to pay $5 per month, or $50 per 6 months, or $80 per 12 months. Arr! There are far better MMORPGs out there, and likely better pirate-themed ones as well. For fans of the movies and those in need of a family-friendly experience, this is a safe bet. It doesn’t do anything exceptionally well, but provides enough entertainment in its many hours of play to attract a fan base that will enjoy its simplicity. But for those looking for a ground-breaking, well-rounded, and perfectly executed experience, lets just say this is not the soundest ship in the fleet.